Love Isn't Enough has a post examining the Atlantic's "The Most Racist Thing That Ever Happened to Me." Here, LIE asks if modern racism has become so subtle and slippery, how are we to teach our children how to navigate it? The Feminist Breeder explains that feminism is not the equivalent of "man-hater" and " the true definition of feminism is good, pure, and important. No one should be ashamed to be a Feminist. If you believe women are human beings and should be treated as such, then you are a feminist, and there’s no reason to deny the word." For those of you looking for something a little less academic and a little more fun, Play At Home Mom has a post on how to make homemade glow-in-the-dark playdough. If you don't have kids, but still want to make it, I won't tell. 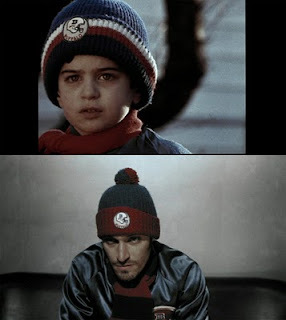 And finally, Kid Casting is a tumblr that has pages and pages of movie stills that feature side-by-side shots of actors and the children who play them in flashbacks. that it seems no one I've ever talked to has seen.